The last few weeks we’ve celebrated the accomplishments and talent of “Girls with Game” across all of Little League’s digital platforms. These incredible individuals, who just happen to be female, serve as role models for us each and every day. A reminder of the power that sports can have on developing the human spirit; an inspiration to keep girls playing the game. Women’s History Month served as the backdrop for us to highlight the accomplishments of many, from Little Leaguers on the field to accomplished professionals, these individuals demonstrate the qualities of humility, courage, and commitment to their work, to their sport, to their families and to advancing a common objective of creating opportunity. Growing up, I had the not-so-unique opportunity to be coached by my dad as a teenager. 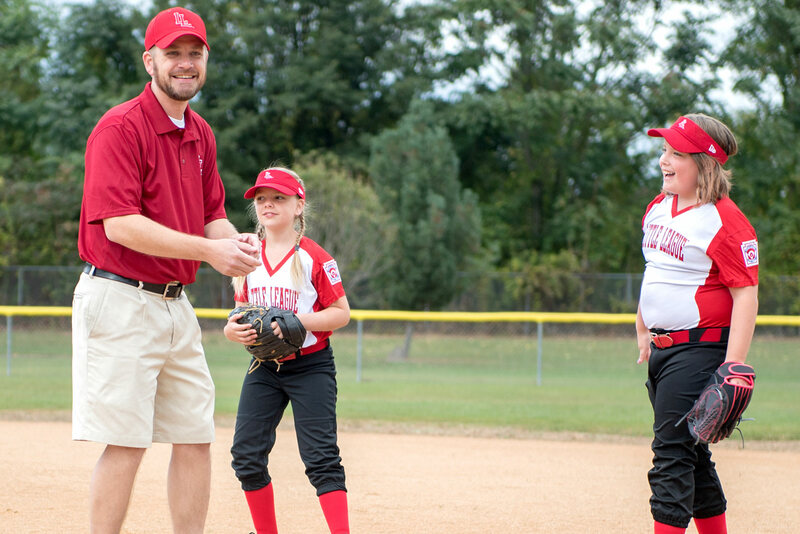 Like many of us that are impacted by the Little League program, being coached by a parent brings with it an added responsibility of being the “coach’s kid.” Whether it’s the preparation for practice or ensuring everyone has a ride home after the game, the magnitude of the coaching experience hits a little harder when your parent is the coach. But later in life, when you reflect on those times, it’s typically one of the first memories that flashes to mind. Making it even more special was that my dad coached me amongst a group of my fellow female athletes. At the time, I couldn’t possibly appreciate the magnitude of being coached by someone who would go on to help me make many tough, life-changing decisions at pivotal moments of my child and adulthood, but looking back on it today, I could not appreciate it more. The first time I heard him talk about P.M.A. was at one of the first practices of the season. His tone made me sit up a little straighter (like when I was in trouble at the dinner table) and pay attention. In my head, I started thinking of long runs or extra drills. But as he continued, whether borrowed or authored, it didn’t matter, the concept was delivered so authentically it sank in. “There are many things you can’t control, but there is one thing that you can control each and every day. And when you come to practice, to the field, to compete, you need to bring it with you. Your Positive Mental Attitude”. As we consider the highlights and accomplishments of the honored Girls with Game, I noticed one similarity in their charge – they all carry their P.M.A. like a badge of honor. It’s evident in their accomplishments, in their challenges, and in the way they view the future. Each of them are faced with the same challenges, similar to the challenges all young girls face as they learn a new skill or play in their first (or 50th) game, but their courage and character shine through in the way they carry themselves both on and off the field. And the message my father shared to me years ago rings ever true today. There are many things you can’t control, but you can approach it all with a positive attitude. As the season continues for the female athletes in our program, we wish them encouragement as they learn, try, and overcome whatever challenges they may face. We hope they learn from it and try again. But, most of all, we wish upon them all a “P.M.A.” And to the moms and dads who are giving their all to coach this season, an extra special thank you to the moments they will remember for the rest of their lives. As we continue to celebrate all of Little League’s Girls with Game, we encourage everyone to join in our celebration by engaging with us on social media by tagging @LittleLeague on Facebook, Twitter, and Instagram and by using #GirlsWithGame to share all your memorable moments.